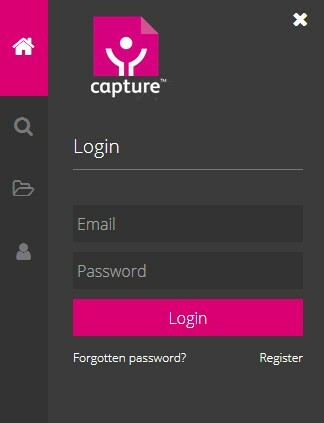 To register or login, first click on the User icon. The panel shown in the figure below will be displayed. To login, enter your email and password and hit the return key or click on the Login button. To register, click on the Register link below the Login box. After you have logged in, the menu icons on the left will change. The User Area icon will become a circle with the user’s initial, and if the user has the status of a contributor, an upload icon will appear (see the section on Contributor Uploads).